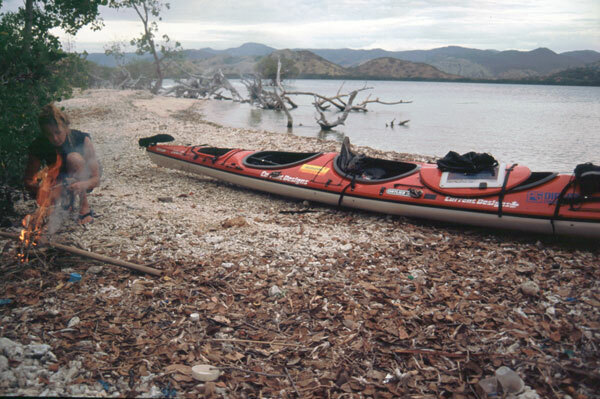 In August of 2005, April and I found ourselves camping on an idyllic islet off the north coast of Flores, Indonesia, during a 7-month kayaking expedition from East Timor to Singapore. An experience that first night on the island left us badly shaken, and our skepticism of black magic and blind acceptance of Western scientific thought both in doubt. This is the first of a three-part excerpt from my upcoming book, To the Brink (published April 1, 2015). Ahead of us was the most beautiful islet either of us had ever seen, a tiny jut of wind-swept grass surrounded by pristine coral beaches. The whole thing measured less than a hundred by three hundred feet, an unsullied pearl set in the balmy waters of the Flores Sea. We made a circumnavigation, looking for signs of human habitation. There were none. “Looks perfect,” I hollered from the rear cockpit. After all the confrontation of the last weeks, it would be a quiet spot to decompress for a few days and not have to deal with anyone other than each other. Pulling the Libra ashore, April and I gathered driftwood to boil a pan of water, then clambered to the highest point, a limestone bluff with a three-sixty-degree panorama, and sat drinking our evening tea. “And all is right with the world again,” I murmured happily, gazing at the twenty-two other islands scattered like gems over a bed of blue velvet. We sat there until dark. Rising to my feet, I heard something in the wind. “Did you hear that?” I said. We scoured the island. It didn’t take long. Were the voices coming from Riung? This seemed unlikely. Riung was eight miles away and the wind was blowing in the wrong direction. Back in camp, we resurrected the fire and boiled some noodles. Nor would there be a problem with security, another reason we usually zipped ourselves in the tent every night, our passports and money safely wedged under our heads as we slept. As we sat in the firelight, taking it in turns spooning from the pan, I watched a column of ants carry a moth to some subterranean doom. The insect was still very much alive, flailing its legs and fluttering its wings. Seeing its futile efforts, I thought of frenzied Lilliputian hordes overcoming Gulliver, and a strange sense of foreboding swept through me. Flicking its tongue, the serpent slithered past and disappeared into the fleshy-leafed vegetation behind the Libra. “Rather knocks the idea of sleeping outside on the head, though, doesn’t it?” I said. After helping April set up the tent, I turned my attention back to the GPS. Every 24 hours, I would send our latitude and longitude position to my father as part of a date-time group in a satellite text message. The army protocol had become a nightly ritual, ensuring that if anything went wrong, someone would at least know where to start looking for us. I heard a shout. “Oh Jeez! There’s another.” A snake with the same black and white markings was approaching from the opposite direction. “And then what eats the snakes,” I said. This wasn’t as far-fetched as it sounded. The same species of giant monitor lizard that inhabited the islands between Flores and Sumbawa a mere hundred miles to the west had been sighted around Riung. Our little island was too small to sustain a permanent population, but the dragons were strong swimmers and known to visit other islands in search of food. This entry was posted in To the Brink excerpts and tagged black magic, human power, Indonesia, kayaking, sea snakes by Jason Lewis. Bookmark the permalink.